We visited multiple athletic clothing and accessory stores across New York City to see how retailers are incorporating the trend into the retail space. The evolution of athleisure in the retail spaces was obvious. Although it was once considered a fad in the fashion and retail industry, athleisure has become more versatile and increasingly tuned into seasonality. According to Trendalytics, online searches for athleisure are up 238% compared to last year. As it evolved, athleisure clothing became a status symbol; it gives the impression that individuals who sport activewear look after their body and strive to stay healthy, lifestyle choices that are important to consumers today. We saw athleisure retailers promoting accessory displays in their brick-and-mortar locations. Under Armour’s Fitness Device Department features its HealthBox, a sleek wearable device which tracks sleep, resting heart rate, steps and even workout intensity. Designers, like Rebecca Minkoff and Michael Kors have embraced technology to create wearable devices in the form of fashionable accessories. Turning functional workout apparel into a fashion staple is as easy as throwing on a pair of reflective sunglasses post SoulCycle class. Accessorizing is key to mastering the athleisure lifestyle appearance. Supermodel Gigi Hadid has mastered post-gym attire. She is typically spotted leaving a workout in leggings, reflective shades and oversized jackets, and almost always adds a pop of color to dark shaded outfits. Other notable accessories include leather jackets, slouchy shirts, quilted vests, hats and handbags designed specifically for the gym. We noticed many retailers display athleisure outfit suggestions in shadow boxes around their spaces. The front display in Niketown features such four shadow boxes. 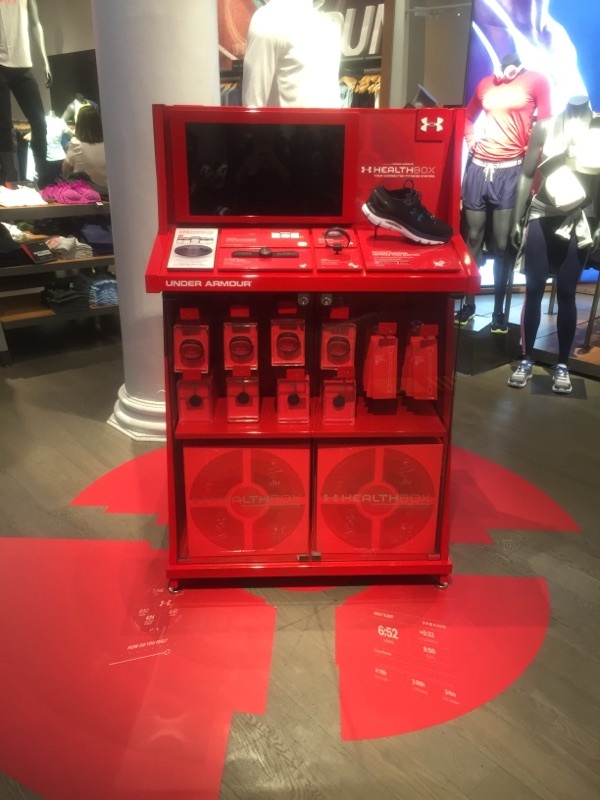 They also have three-dimensional boxes mounted on the wall next to digital touch screens with outfit suggestions and the option to purchase lifestyle sneakers directly from the display. Retailers are revamping their brick-and-mortar locations to attract athleisure shoppers. Gone are the days of stiff mannequins lurking behind racks. 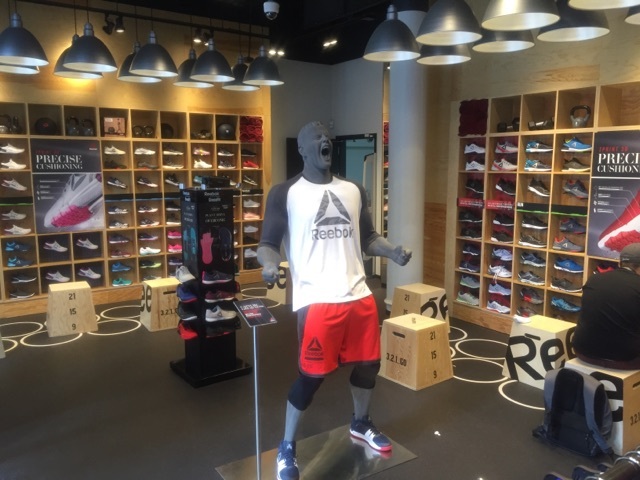 Shoppers can now find life-like mannequins who wear the newest activewear lines or life-size replicas of celebrity influencers, such as JJ Watt for Reebok. Foot Locker recently redesigned its flagship store on 34th Street in New York City. The new layout includes spaces within the store for top athletic brands to showcase their products and allows customers to easily shop by brand. For example, the space includes an Adidas and Puma section. 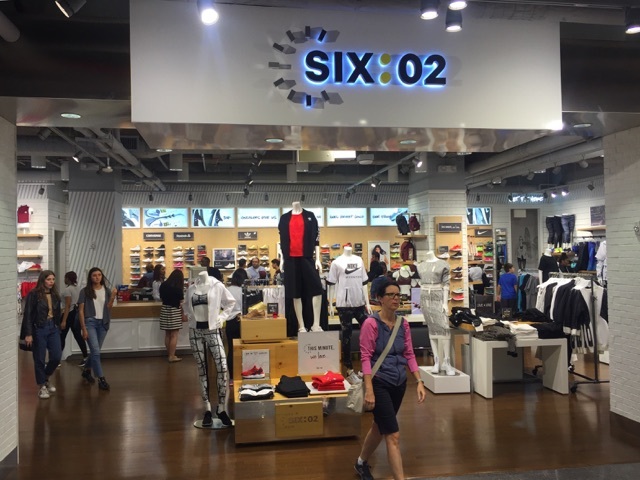 We found a shop called Six:02, a fitness fashion boutique for women, within Foot Locker. The boutique’s name is based on the time they encourage women to work out: 6:02 am—the time to wake up and go to the gym; and 6:02 pm—the time to leave work and attend a spin class. It is dedicated to all things athleisure and offers high-end and more affordable fitness clothing, footwear and accessories. There are also small descriptions next to most items to educate consumers on the features of the product. Other retailers, such as Nike, also have these descriptive signs. coaching. They also regularly hold events to promote new products. 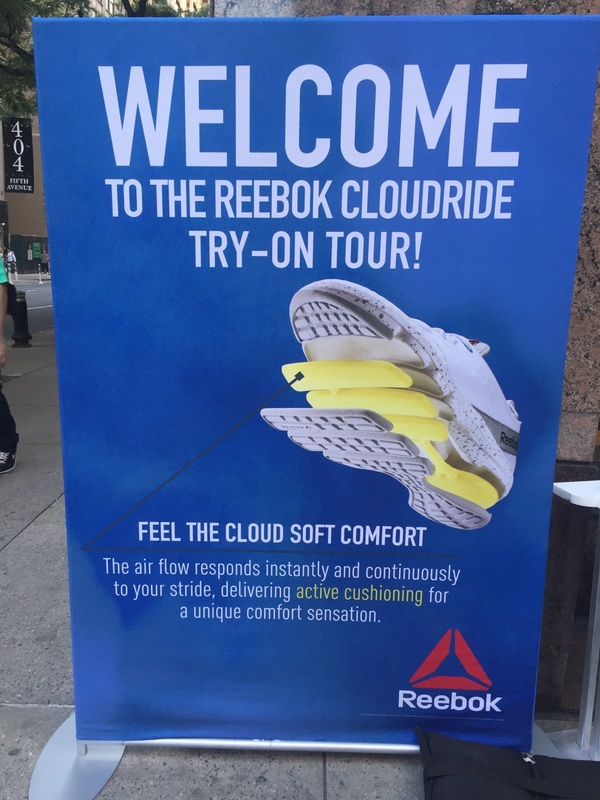 Recently, the Reebok on 5th Avenue had a stand outside their front door to promote their new Cloudride DMX shoe. When someone simply tried on the shoe, they received a free backpack or water bottle. Nike recently partnered with Teen Vogue to attract consumers to its New York City store. Teen Vogue styled outfits from Nike’s new Tech Fleece line for customers and then brought them into a special room for a photoshoot. When companies create fun and engaging in-store experiences like these, it is a win-win situation for the retailer and the customers. Brick-and-mortar shopping becomes enjoyable and exciting for consumers, and retailers can draw more traffic. BirchBox, an online subscription-based service that sends subscribers four–five beauty product samples each month, noticed a niche market within athleisure that had not been touched—beauty. In January 2016, they launched the first round of products for their second beauty brand, Arrow. It was designed to keep up with active lifestyles, and specializes in lightweight makeup and refreshing skincare specifically formulated to enhance natural beauty before and after physical activity. This is a unique segment in the beauty industry that has not been fully tapped. Staying healthy and fit is important to many individuals and the option to wear makeup that lasts through a workout could enhance this routine. It is an opportunity for beauty companies to create new products for active individuals. In 1998, Lululemon was one of the only brands that sold fashion-forward activewear clothing. They spearheaded the concept of wearing yoga pants outside the studio. Now designer brands such as Alexander Wang, Stella McCartney, Michael Kors and Givenchy have all joined the athleisure trend; it has become the new uniform. Athleisure influence has steered consumers away from denim—sales have dropped 5% or more every year since 2013—and toward $400 leggings from Bergdorf Goodman and other retailers. At this year’s New York Fashion Week (NYFW), designers presented creations for their Spring/Summer 2017 (SS17) line. Brands such as DKNY and John Elliott showed high-end athleisure inspired pieces and fabrics. Rhianna’s latest luxury athleisure collaboration with Puma has its own section in the Foot Locker we visited. At one point, athletic clothing did not have trends or even change from season to season. Now, this evolution is obvious in the retail industry, especially during NYFW. Some of the biggest trends of the season are driven by athleisure, including sweatshirt dresses, tracksuits and knee-high boots. 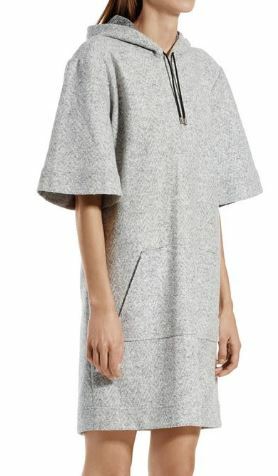 Brands have transformed typical sweatshirts into dresses and paired them with knee-high boots to drive the athleisure trend. These pieces work because they are casual, functional and ideal for layering. Alexander Wang collaborated with Adidas to create his own athleisure line which according to Wang, “subverts boundaries between fashion and streetwear.” We believe the more designers promote this trend, the more people will purchase clothing, shoes and accessories, and this is obviously positive for the retail industry. Americans spent $44 billion on active wear in 2015, an increase of 16% from 2014, according to CBS. This trend spread from the mass market to high-end luxury brands, a pattern that typically spreads in the opposite direction. Retailers are incorporating athleisure into their stores by showing customers how to accessorize, they are revamping the customer in-store experience and updating athletic clothing each season to keep athleisure styles fresh. For more pictures from our athleisure store tours head over to our Facebook page.